Visits: 36209 persons viewed this recipe. Ghee rice is a great dish to accompany any type of curry on any occasion, festive or ordinary. The aroma of fragrant rice and clarified butter along with spices announces that it is time to stop whatever one is doing and sit down for a very satisfying meal. 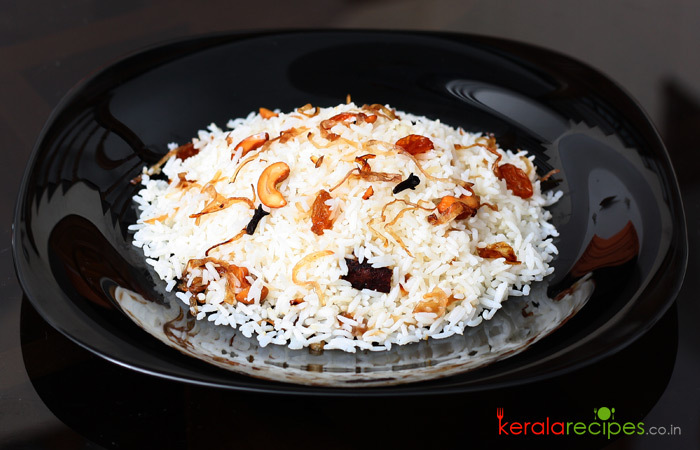 The ghee rice is enriched by raisins, cashew nuts and many types of spices including cardamom, cinnamon, and cloves. The dish is topped by sliced onions caramelized to perfection and scattered over the mound rice. The best part of making dish is that it is not very time consuming, and teamed with chicken, egg, or fish curry makes a very satisfying. The family members, as well as the visitors, are bound to enjoy eating ghee rice with relish along with curries. Wash rice, soak in water for 15 minutes and drain it well. Heat 3 table spoons of ghee in a cooking vessel, fry cashew nuts, raisins and finely sliced onion separately till golden brown and keep aside (while frying onions, when it is almost done add 1 tea spoon of sugar so that the fried onions remain crisp throughout). Heat ¼ cup of ghee in the vessel, put cinnamon, cloves & cardamom and stir it for few seconds. Proceed to add rice and stir for 5 minutes. Add 7 cups of hot water and 1 tea spoon of salt. Cook it covered till done. (Give a stir in between.) Turn off the heat when the water is absorbed by the rice. Keep it closed for another 10 more minutes. Open the lid and garnish with fried onion, cashews and raisins. Serve ghee rice hot with gravy type curries, salad, pappad and pickle. Hi your recipes are very good, explained simply…. congratz. But here you said ghee 1/3 (33%) in list and 3 tb spoons + 1/2 (more than 50%) in method. Pleases clear this error. Thank you. Hari, I am sorry, it was my mistake and it is fixed now. Thank you very much for the feedback. Dear Shaan, I have a doubt how it prepared in large scale? for eg: 10kg rice how we become calculate the quantity of water? it is so difficult to cook. please give a solution to add water on large scale. Suresh, The ratio is, for 1 cup of rice we should add 1¾ cup of water (1 : 1¾). I am not sure about the ratio in kilograms. If you have large quantity, measure it using some big mugs. Hi Shaan, all your recipes are tasty and very easy to prepare. Please add fried rice and paneer butter masala recipe too. Thanks a lot Nayana. I will try to include it. Hi, I tried this recipe today. It was very tasty. Add more delicious recipes for kids too. Thanks Sanitha. I will try to do it.